... and you are gonna like it! 1 ... and you are gonna like it! 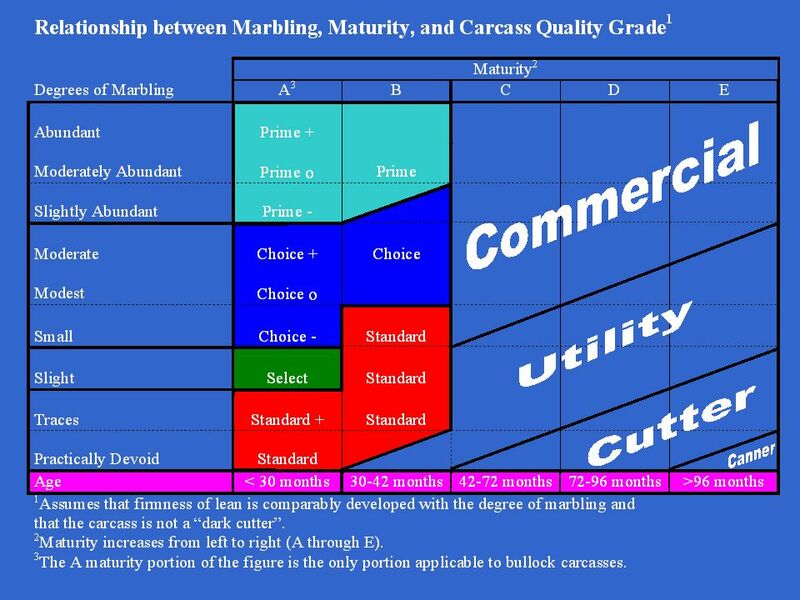 3 What is the purpose beef carcass grading? To allow beef producers, packers, and retailers to be paid for the level of quality product they distribute. 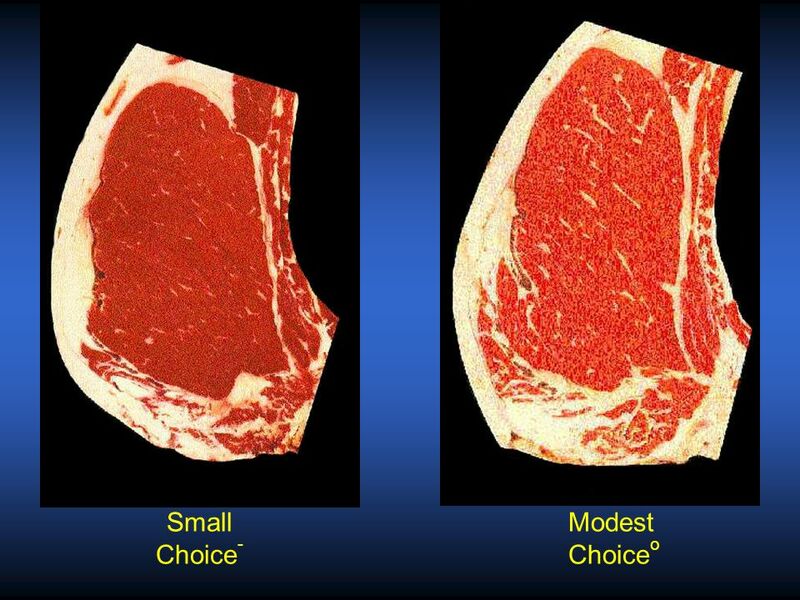 The USDA implemented meat grading to ensure that the product is of the right quality that consumers want. 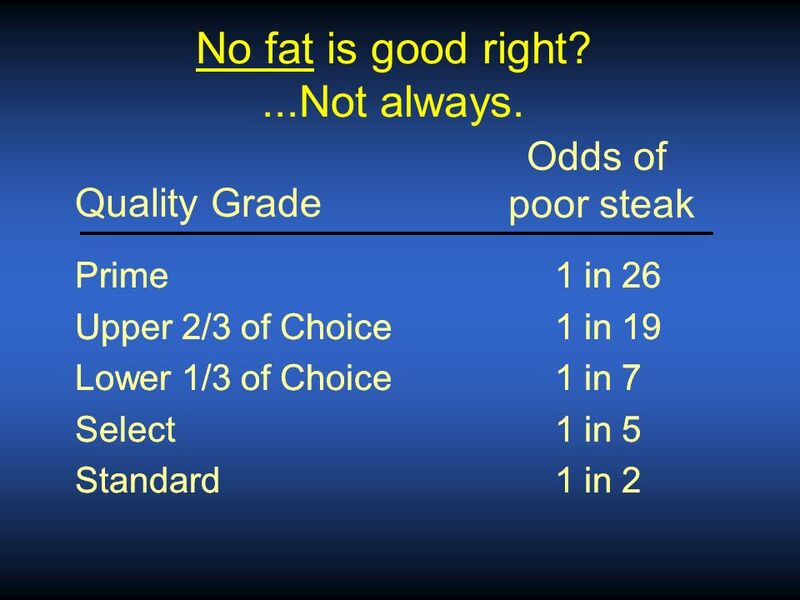 To create a basis for comparison and data in the beef industry. 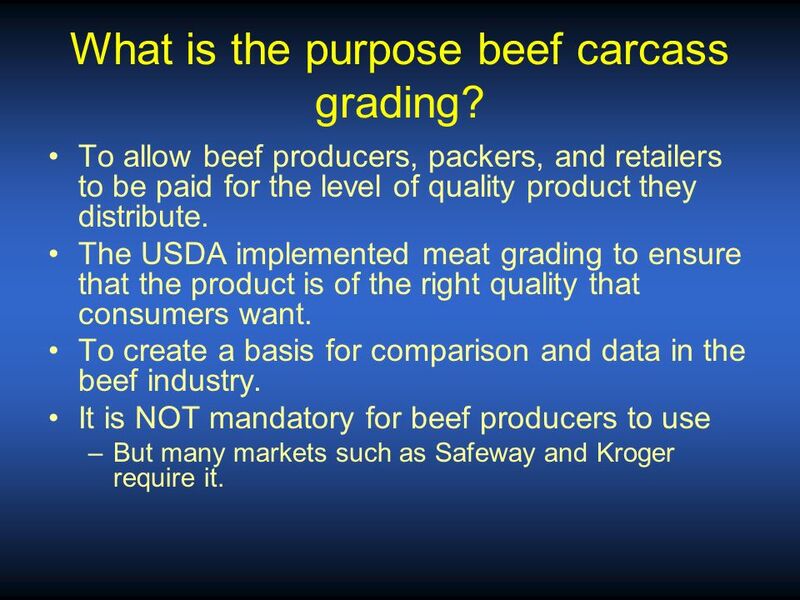 It is NOT mandatory for beef producers to use But many markets such as Safeway and Kroger require it. 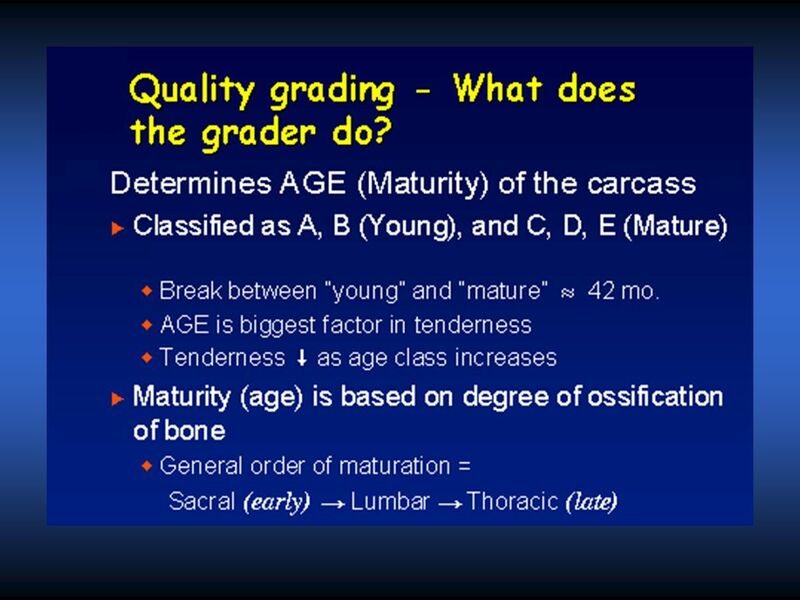 4 How do beef grades affect me? 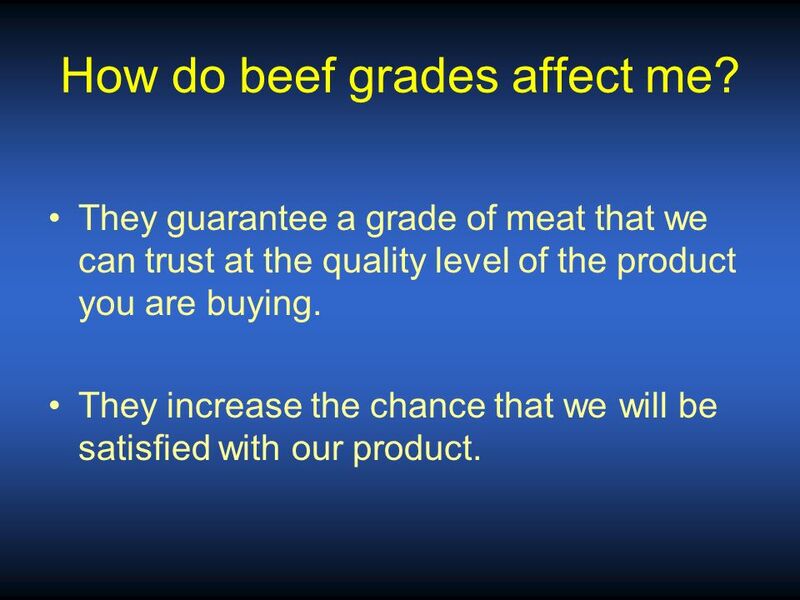 They guarantee a grade of meat that we can trust at the quality level of the product you are buying. They increase the chance that we will be satisfied with our product. 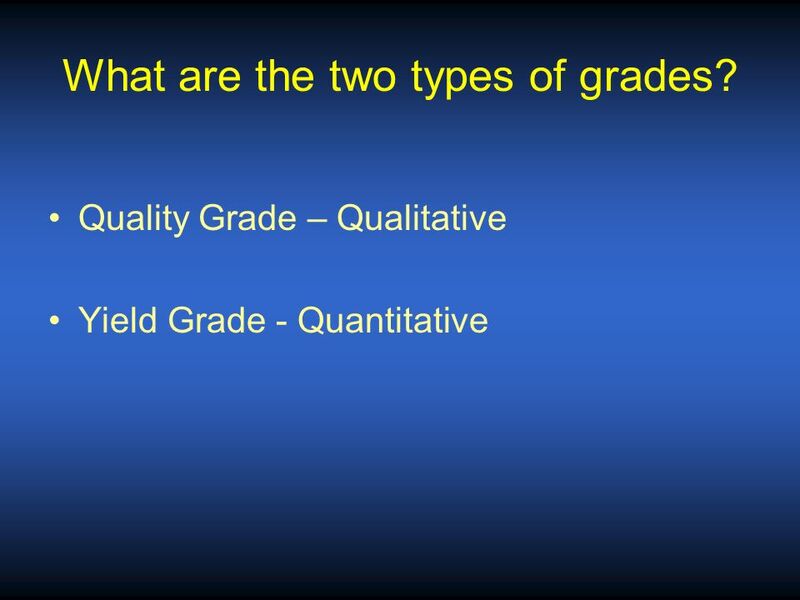 5 What are the two types of grades? 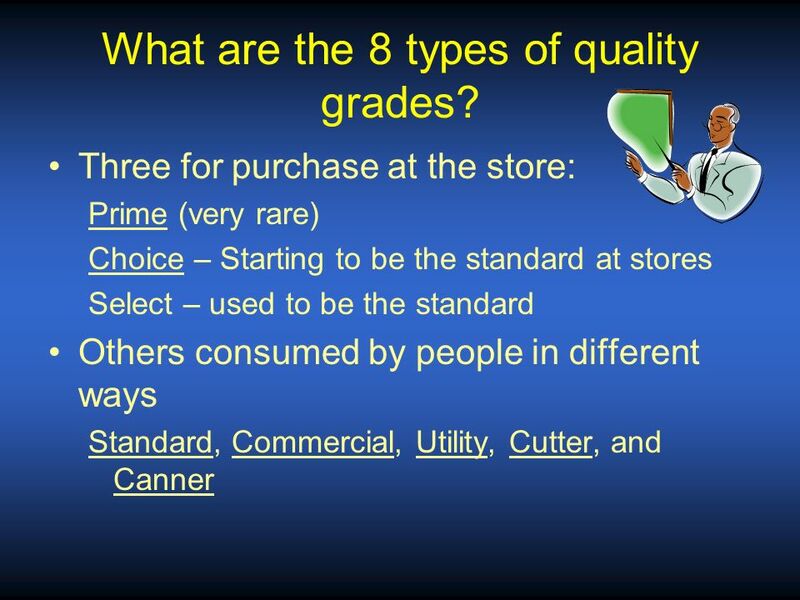 7 What are the 8 types of quality grades? 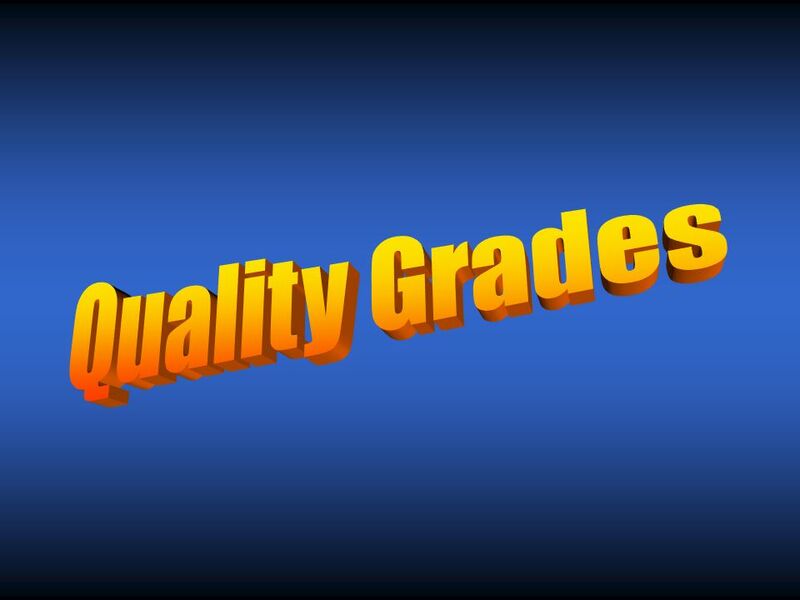 8 What is the purpose of Quality Grades? 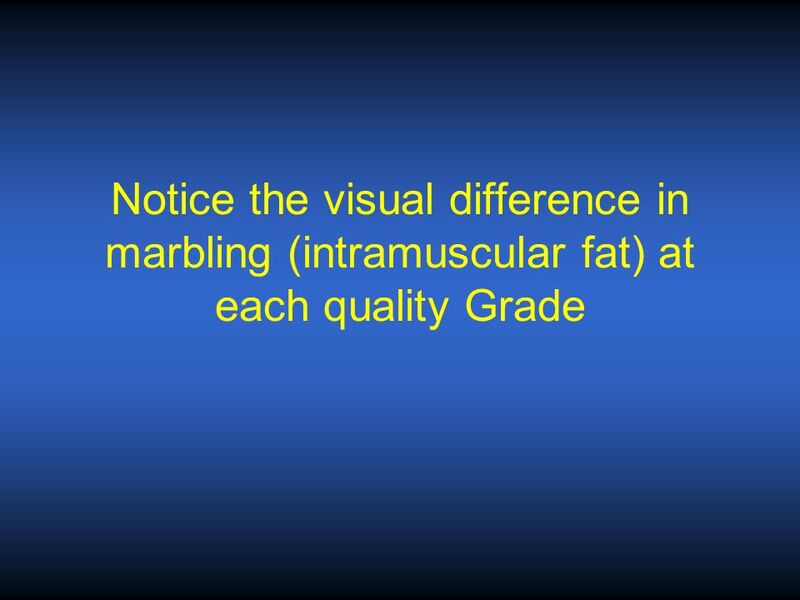 Reflects the differences in the eating quality of meat based on: Marbling scores - the amount of fat interspersed in the muscle. 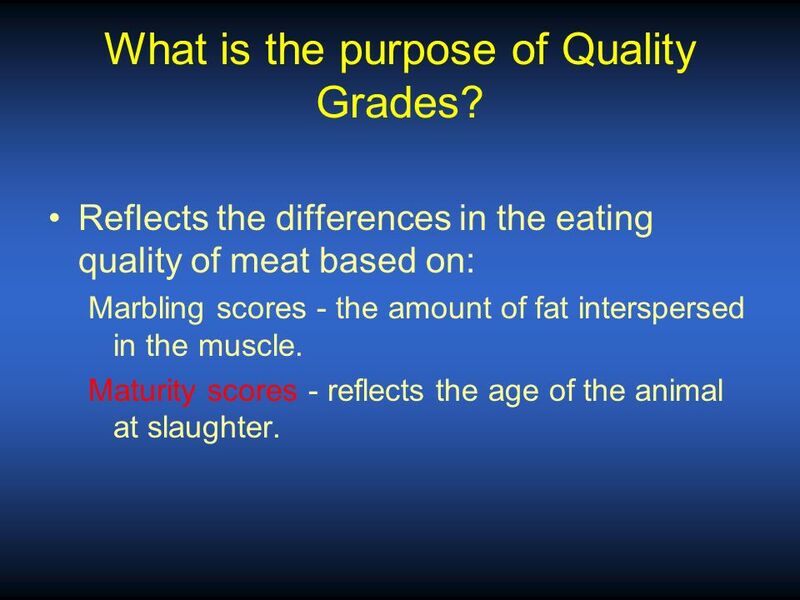 Maturity scores - reflects the age of the animal at slaughter. 12 No fat is good right? ...Not always. 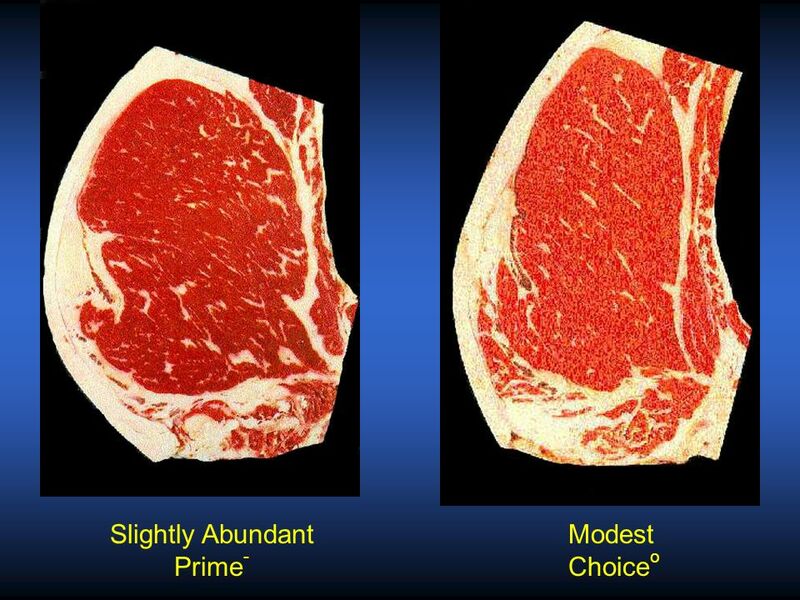 13 Prime This carcass has superior marbling, proper carcass conformation, and adequate maturity. Found in fine restaurants and gourmet stores. Not economical for meat packers The cattle are required to get very fat to obtain enough marbling A small percentage of cattle meet the conformation standards. 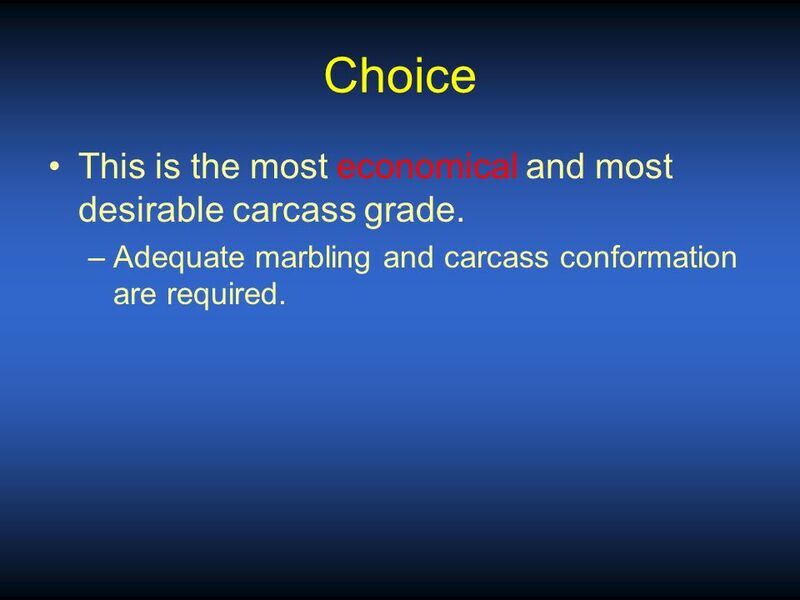 14 Choice This is the most economical and most desirable carcass grade. 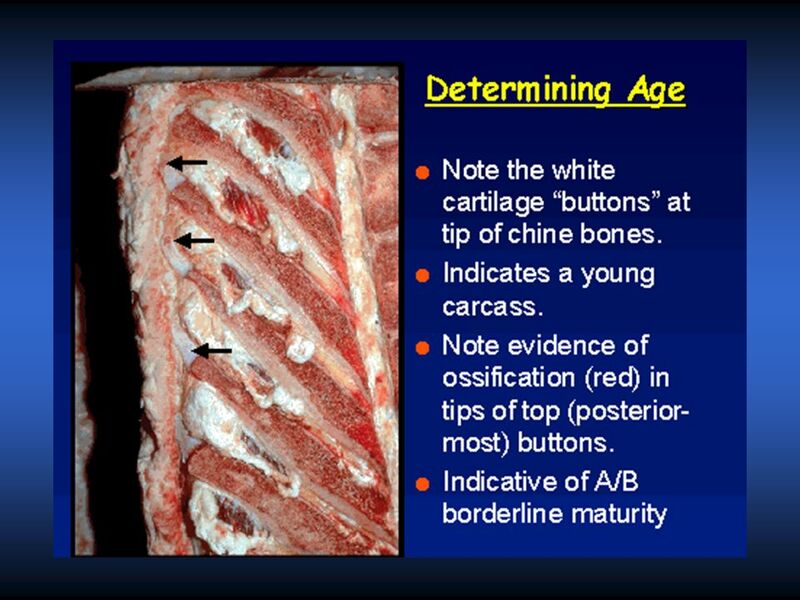 Adequate marbling and carcass conformation are required. 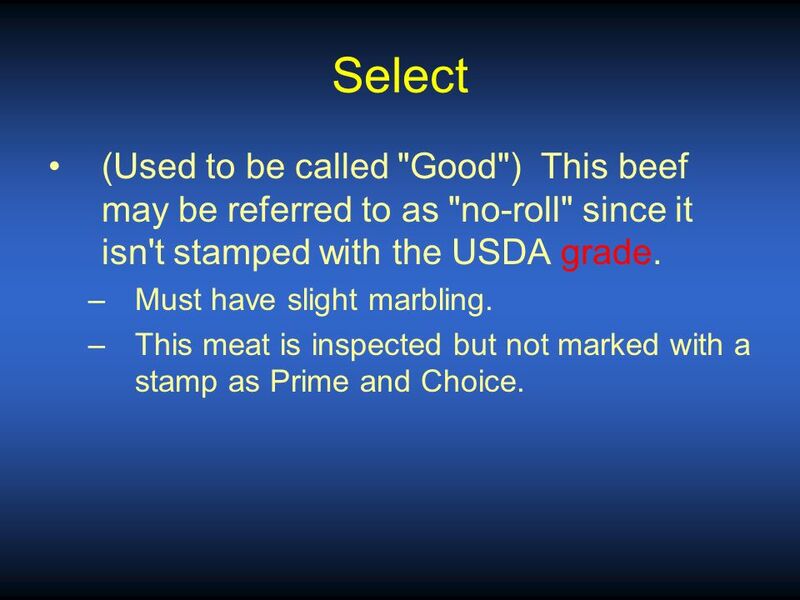 15 Select (Used to be called "Good") This beef may be referred to as "no-roll" since it isn't stamped with the USDA grade. Must have slight marbling. 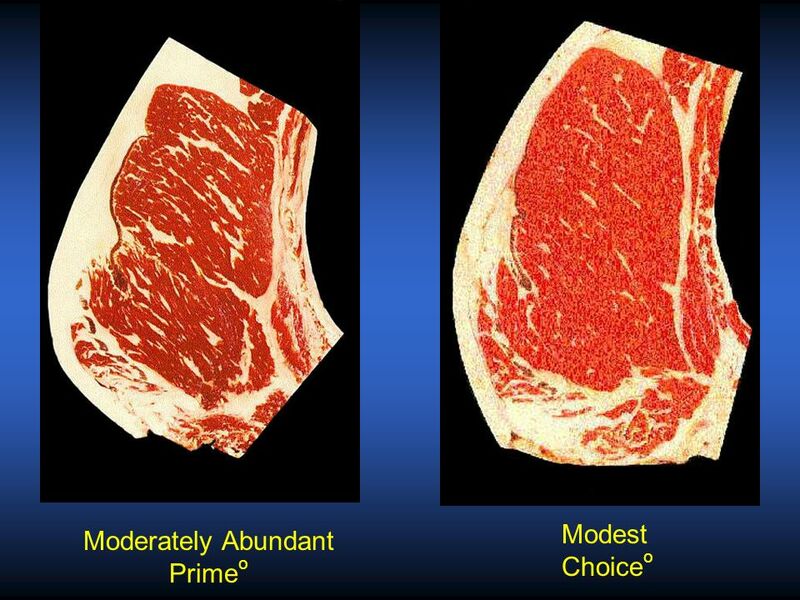 This meat is inspected but not marked with a stamp as Prime and Choice. 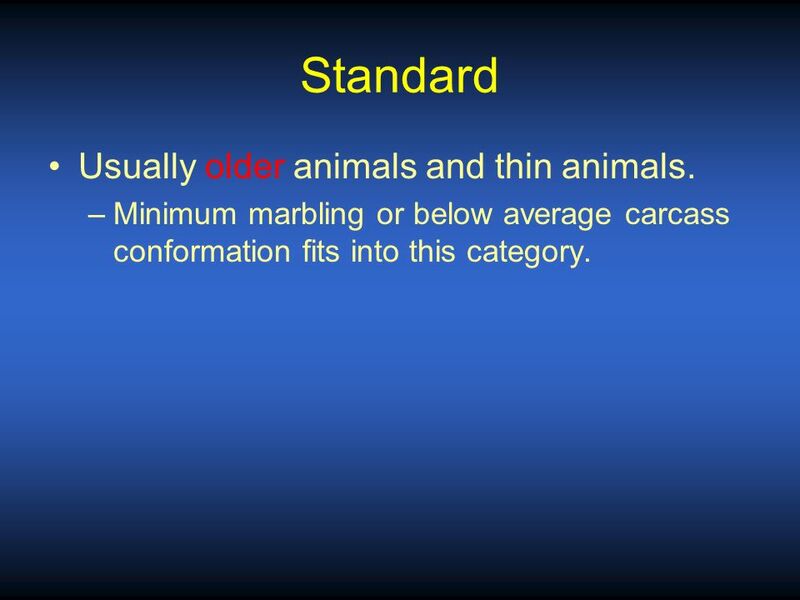 16 Standard Usually older animals and thin animals. 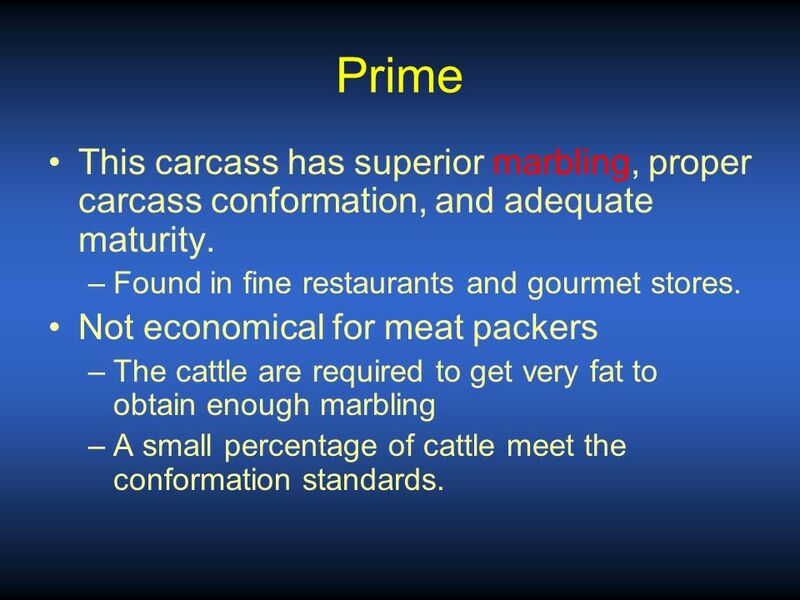 Minimum marbling or below average carcass conformation fits into this category. Cutter Canner Utility. 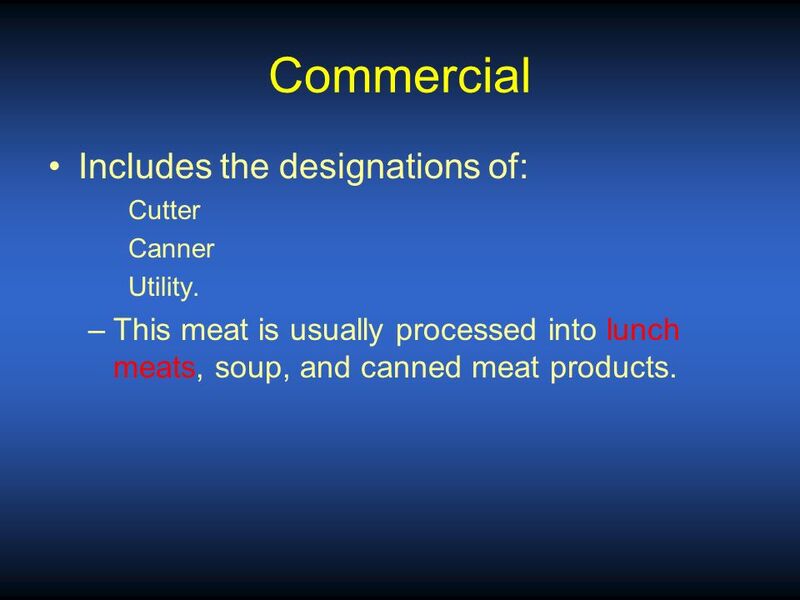 This meat is usually processed into lunch meats, soup, and canned meat products. 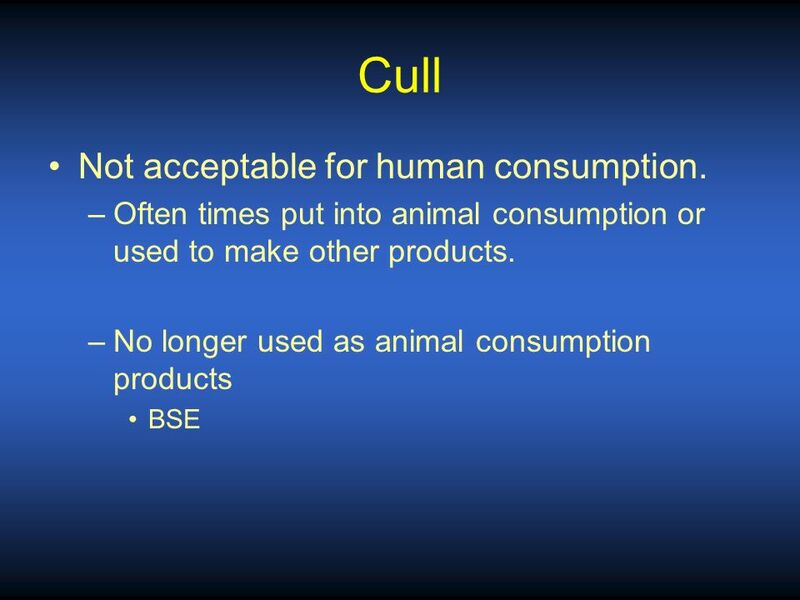 18 Cull Not acceptable for human consumption. 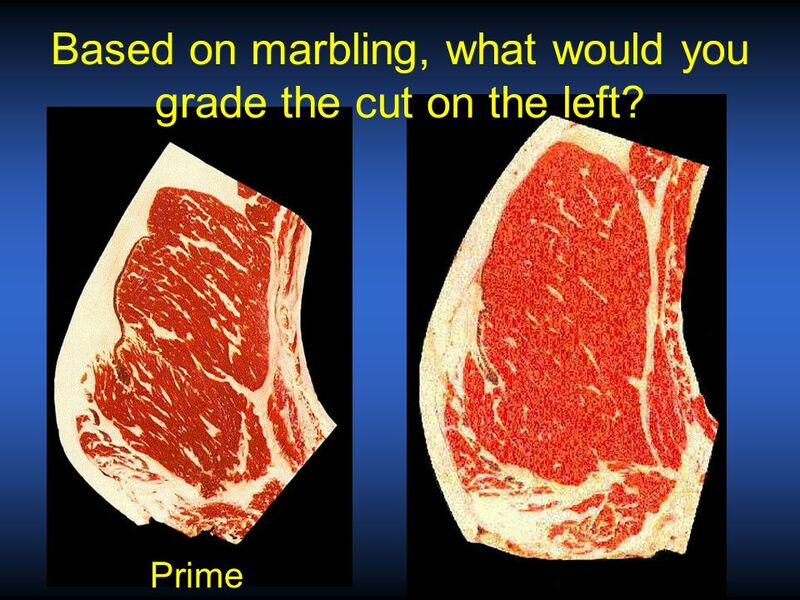 29 Based on marbling, what would you grade the cut on the left? 30 Based on marbling, what would you grade the cut on the left? 31 So what do we take from this? Why do we need to know this information? Do we go and buy the highest quality? 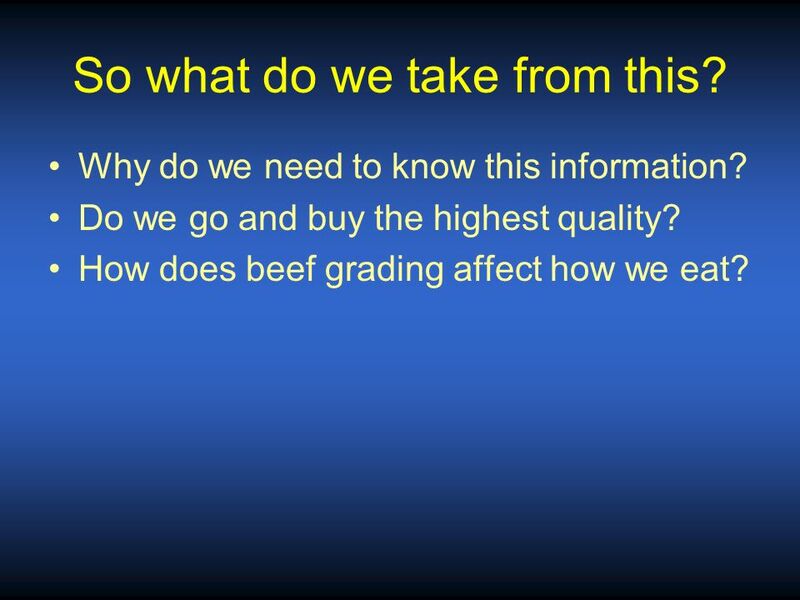 How does beef grading affect how we eat? 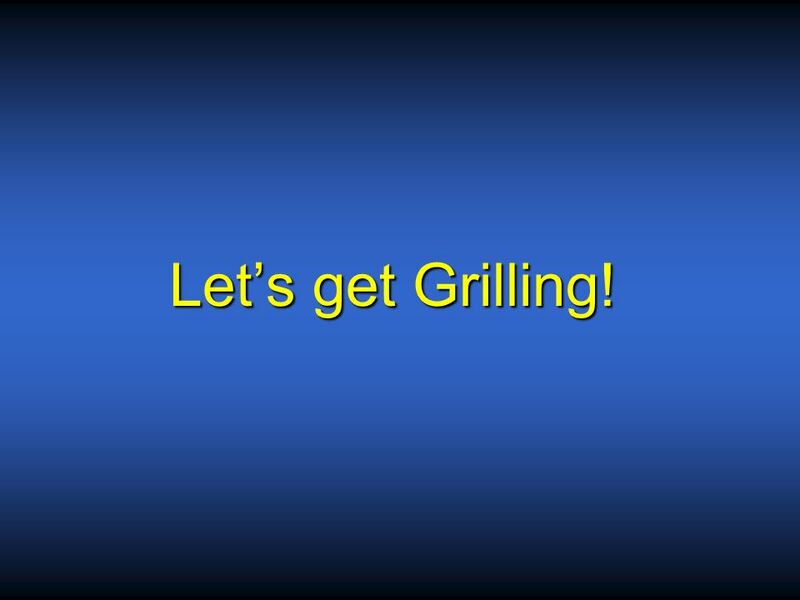 Download ppt "... and you are gonna like it!" 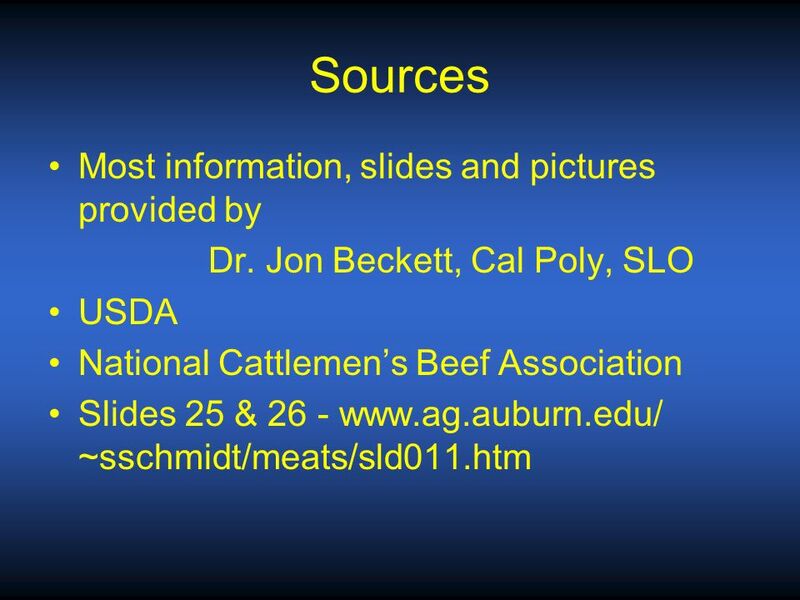 Cattle By: Kristi Hart Livestock Evaluation. Objectives Identify ideal structure, soundness, finish. 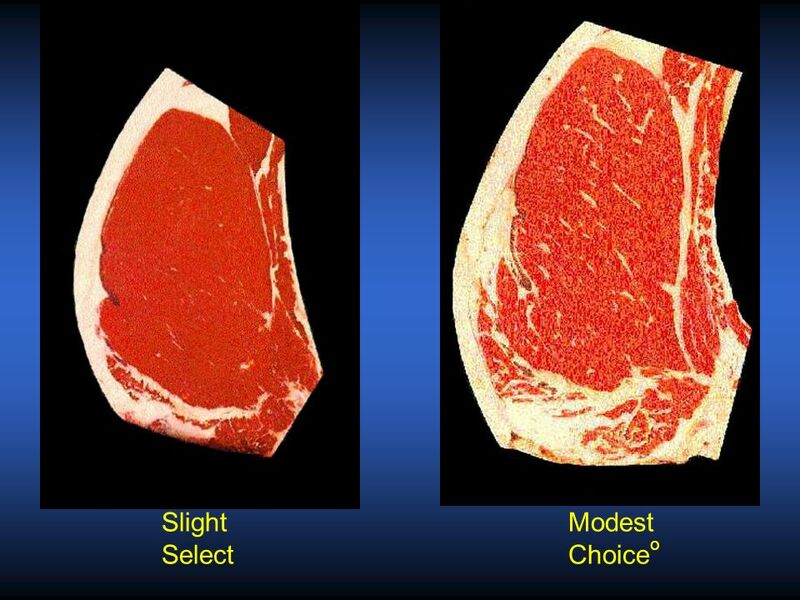 Describe an ideal market steer. Beef Grading Dr. Gretchen Hilton Assistant Professor Meat Judging Team Coach. Welcome to the Wonderful World of Meat! 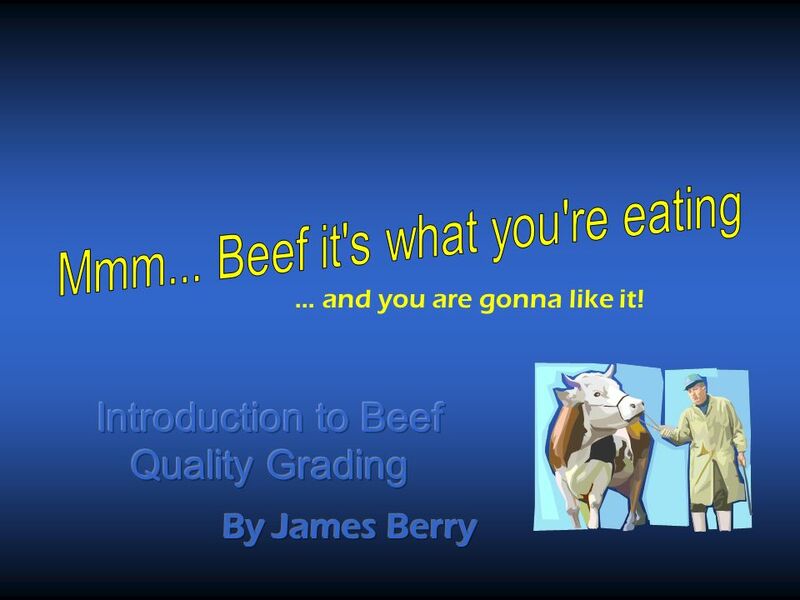 Beef Grading J. Brad Morgan Oklahoma State University. 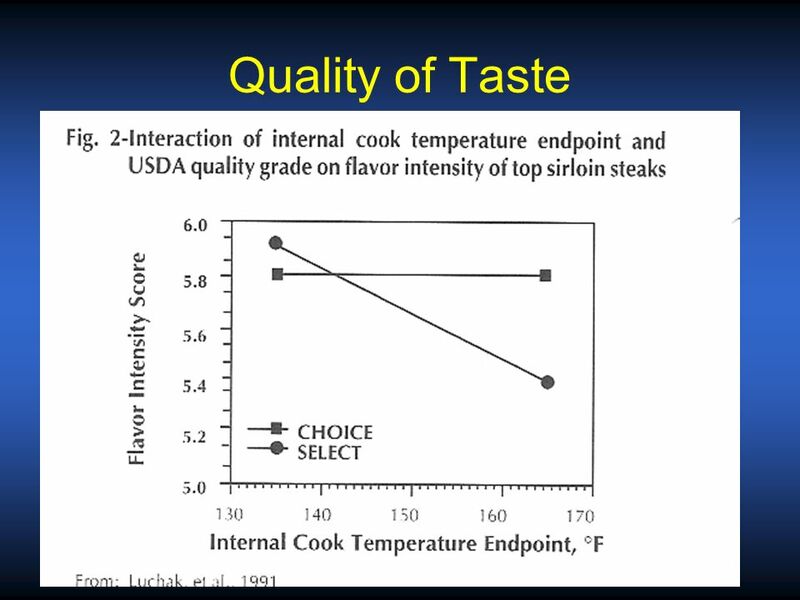 Grain Fed Beef Grass Fed Beef CAB™ Beef Production Tricky Marketing. Meats and Offal Chapter 13. 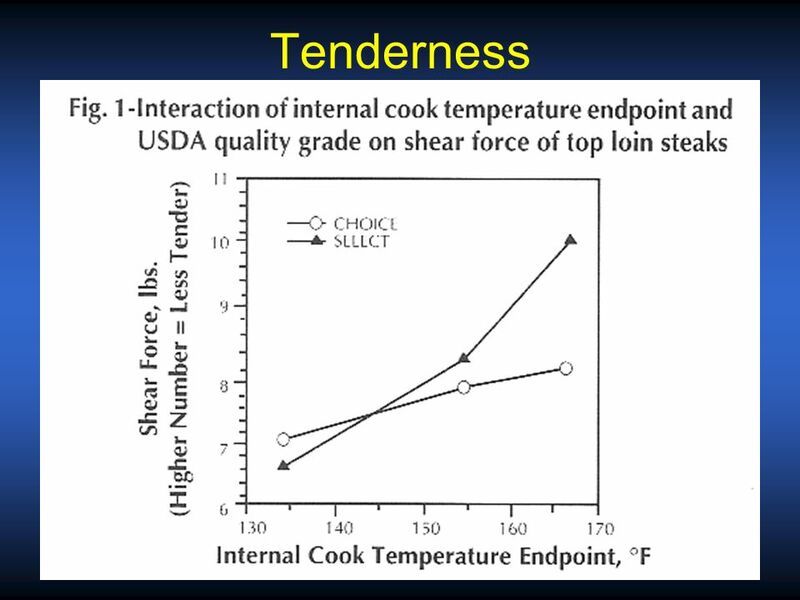 USDA Quality and Yield Grades Established in 1927 Sets standards of quality and cutability (yield of edible meat) Assures products that conform to. Fundamentals of Ag. 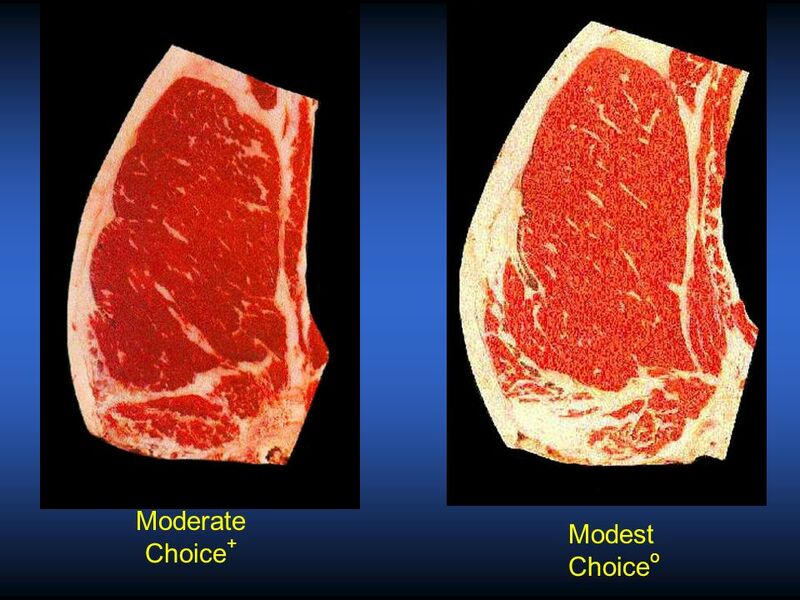 The Meat We Eat. Terminology. 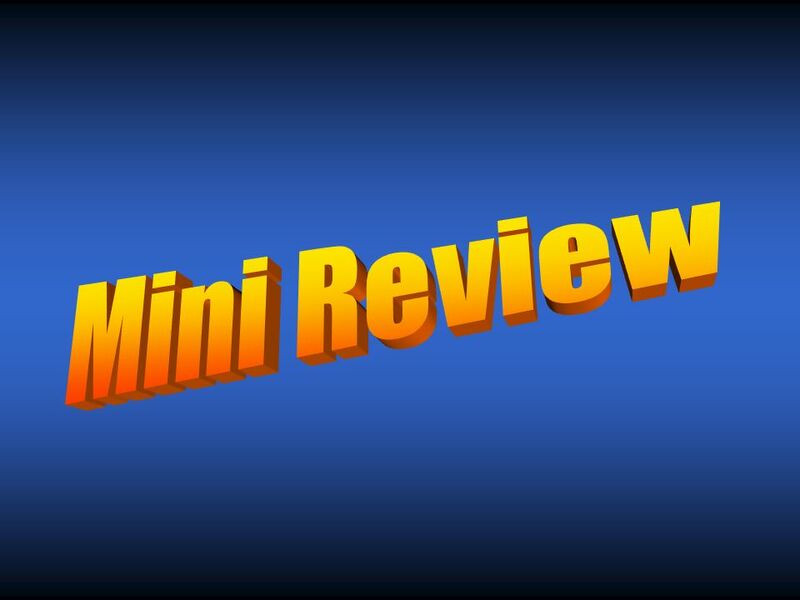 Principles of Livestock/Poultry Evaluation and Showmanship. Meat Goat Carcass Merit Dr. Dwight Loveday University of Tennessee-Knoxville Department of Food Science & Technology. Live Cattle Evaluation. What are we trying to determine? 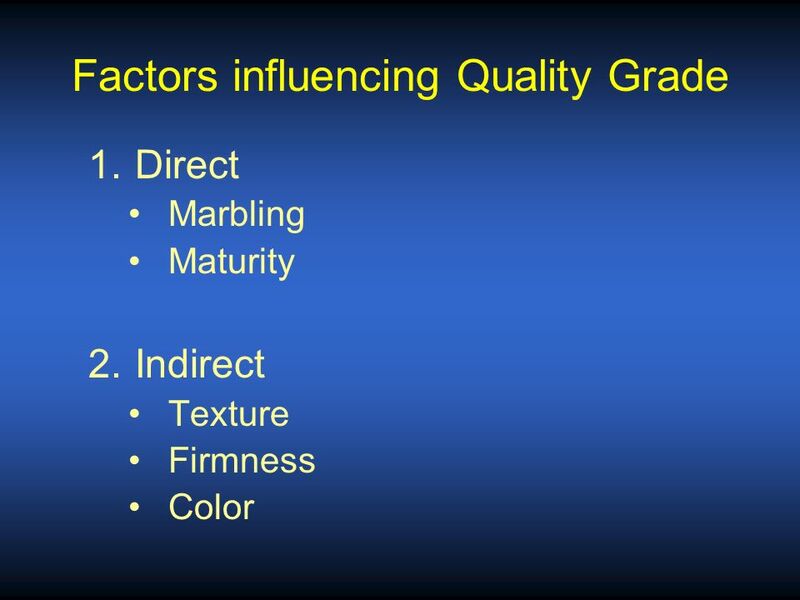 u Quality grade u Yield grade u Dressing percentage. 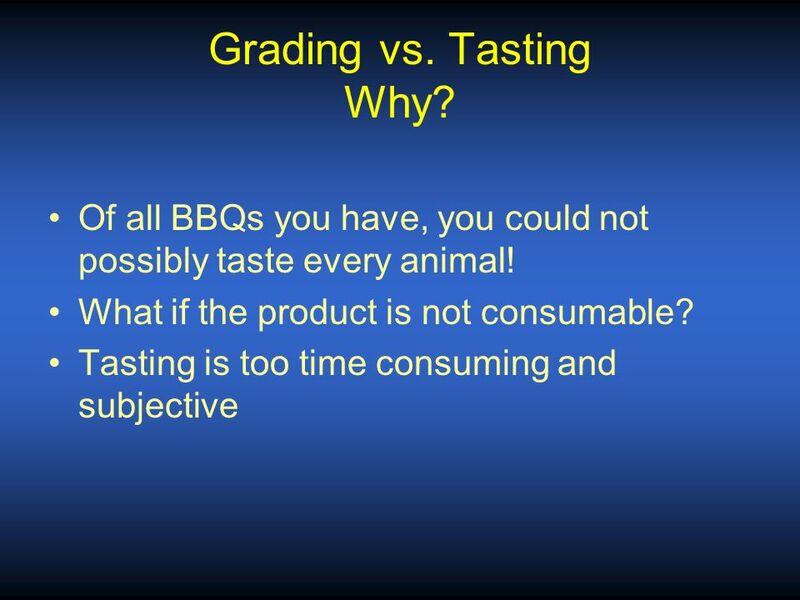 MARKET CLASSES AND GRADES OF MEAT ANIMALS By David R. Hawkins Michigan State University.